The Wisconsin State Fair is an annual, eleven-day festival that celebrates Wisconsin farming, livestock, and agricultural products. The first Wisconsin State Fair took place in 1851, along the Rock River in Janesville. 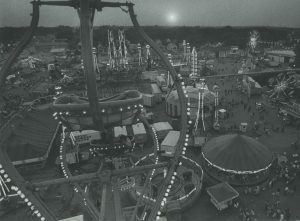 The fair lasted only two days, and 13,000-18,000 patrons attended the festivities. Over the next forty years the fair moved to various locations across the state, including Fond du Lac, Watertown, Milwaukee, and Madison. In 1891 the Agricultural Society of the State of Wisconsin choose a new location for the fair, purchasing land in West Allis and constructing a 6,000-seat grandstand along with a large racetrack and exhibition halls for animals and commodities. Farmers and agricultural enthusiasts competed for blue ribbons in livestock and produce competitions; horse races garnered large crowds of spectators; and local musicians performed on small stages scattered throughout the grounds. Livestock shows featured cattle, horses, sheep, and swine. As more farmers brought their animals to the fair for a coveted blue ribbon and prize money, fair officials and the Blue Ribbon Sale of Champions Foundation created the Wisconsin Governor’s Auction in 1968. Sitting Wisconsin governors continue to preside over the auction, and all bids are given to the Wisconsin 4-H Foundation to fund scholarships for promising Wisconsin students. As the fair became more popular in the twentieth century, visitors were drawn to its culinary specialties. The Wisconsin Bakers Association sold the first Cream Puff, the fair’s iconic food item, in 1924. Fair attendees regularly consume 350,000-400,000 Cream Puffs every year. As the Fair grew in popularity, the state purchased the surrounding land and built permanent buildings for retail exhibitions, food and beverage service, and the state fair administration. 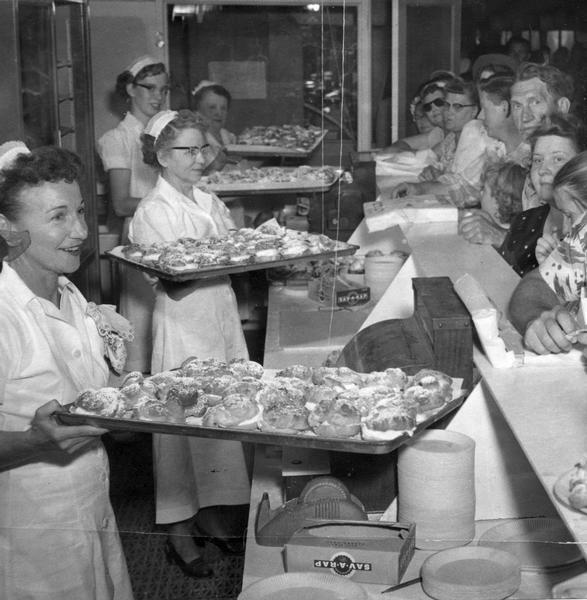 Such Milwaukee dining establishments as Major Goolsby’s, Saz’s, and Miss Katie’s Diner joined the festivities, opening stands and serving fair-goers cheeseburgers, pulled pork sandwiches, mozzarella sticks, and roasted chicken. Attendees also enjoy a number of deep-fried foods, such as cheese curds, pickles, bacon, and Oreos. The fair provides a daily parade, concerts, dance performances, food-eating contests, pig and duck races, pony rides, and even cow milking lessons for children. The University of Wisconsin-Madison, the state’s land grant university, has naturally developed a close relationship with the fair. One day each year is “UW Day,” which features activities for fair patrons organized by the Wisconsin Alumni Association. In return for small donations of canned goods or school supplies at the gate, fairgoers receive a ticket discount and are treated to a parade by the University of Wisconsin Marching Band. Today the Wisconsin State Fair draws over one million visitors every year, offering patrons musical entertainment and amusement rides, along with a plethora of food items that promote Wisconsin’s dairy heritage. ^ Jenny Lewis, Midwest Sweet Baking History: Delectable Classics around Lake Michigan (Charleston, SC: The History Press, 2011), 185. ^ “History of the Wisconsin State Fair,” WISN 12, July 30, 2009, accessed September 11, 2015. ^ “History of the Wisconsin State Fair”; Albert Muchka, Images of America: West Allis (Chicago, IL: Arcadia Publishing, 2003), 99. ^ Jackie Askins, “2015 Governor’s Blue Ribbon Meat Products Auction,” University of Wisconsin-Extension, August 15, 2015, accessed September 12, 2015. ^ Harva Hachten and Terese Allen, The Flavor of Wisconsin: An Informal History of Food and Eating in the Badger State, 2nd ed. (Madison, WI: Wisconsin Historical Society Press, 2009), 140. ^ “Original Cream Puffs,” Wisconsin State Fair website, accessed September 11, 2015. ^ Megan Sukovich, “Top 10 Things to See and Do at the Wisconsin State Fair,” West Allis Now, http://www.westallisnow.com/news/top-10-things-to-see-and-do-at-the-wisconsin-state-fair-b99319446z1-269040801.html, July 29, 2014, accessed September 11, 2015. ^ “UW-Madison Day at the Wisconsin State Fair,” University of Wisconsin-Madison website, August 2014, accessed September 12, 2015. ^ “A Shared History and Future: UW-Madison and the Wisconsin State Fair,” Wisconsin Badgers website, July 2011, accessed September 11, 2015. ^ Marion Renault, “Wisconsin State Fair Attendance Tops 1 Million for Third Straight Year,” Milwaukee Journal Sentinel, August 17, 2015, accessed September 11, 2015. Apps, Jerry. Wisconsin Agriculture: A History. Madison, WI: Wisconsin Historical Society Press, 2015. Muchka, Albert. Images of America: West Allis. Chicago, IL: Arcadia Publishing, 2003.